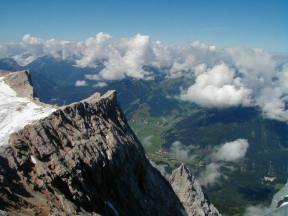 In the Bavarian Alps, along the border with Austria, is the Zugspitze, the highest mountain in Germany. The Alps rise steeply upward from the relatively flat plains surrounding them, giving starking relief. The Zugspitze is part of a limestone massif that towers over the town of Garmish-Partenkirchen where we stayed for our trip to Bavaria. A series of jagged peaks give a good representation of the vertical drop to the valley floor. We rode in a cable car from one of the tiny specs in the distance. The car only took about 10 minutes to get to the top...the trees were zinging by! 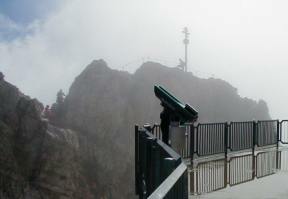 Clouds and mist surrounded the actual summit. A golden metal cross marks the peak. Zugspitze is 2964 meters, or 9724 feet tall. It's kind of small compared to the 14,000 feet peaks in Colorado, but the timber line is much lower and vertical difference from the valley below is about the same as from Colorado Springs to the top of Pike's Peak. We rode another cable car down into the bowl to catch the cog train back to our starting point. There were still skiable snowfields in the area. There was also a chapel that had a Catholic service once a week - noon on Sunday. After we got back from visiting the Zugspitze, we had a whole afternoon to kill. 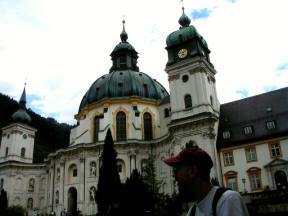 So we got some information, and headed back out to visit the Ettal Monastery to the northwest of Garmisch. Dale standing in the courtyard in front of the cathedral. 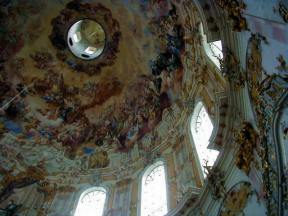 The inside of the cathedral dome was elaborately painted with murals with a Biblical theme. Nearly every ornament such as sculptures and door trim was gilded in gold. After we visited the grounds, we thought the fun was over. Then I heard the faint sound of music, and saw several people disappearing beyond an archway out of the courtyard. We followed them, and discovered a full-fledged festival going on complete with traditional garb and umpa band. A large air-filled castle was wiggling with bouncing kids, and a vertical wall with handlholds and harnesses was set up for the more adventurous climbers. A full-sized band was set up on a platform, playing vigorous music while even more youngsters danced on the wooden stage together. It was neat to see all the families talking and dining together. 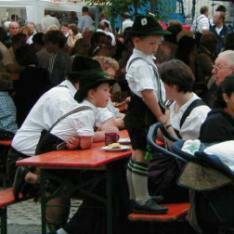 The little boys had their lederhosen outfits and wool hats that matched their dads. The women and girls had cute little traditional dresses with braided hair. There was also fantastic food for a very reasonable price, and we were also given real plates and silverware to take to the table. 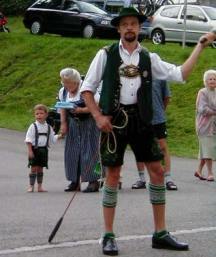 Only in Germany! It was just our responsibility to return the tableware to the place they were washing them. As we were eating, several gentlemen with woven whips climbed onto each table. Then the band started playing, and these guys cracked their whips to the music. They each had two, which were apparently different pitches. How unique! 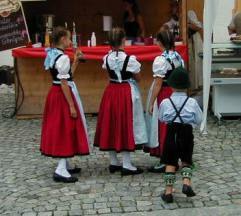 This scene of a grandma ("Oma" in German) with her little grandson caught my eye just beyond one of the whip musicians. I thought it was really cute. Riley seemed to be entertained by this rare music, but it was a bit loud. It was kind of like a bunch of black cats or ladyfingers going off on the 4th of July! It was so cute to see him blink every time! 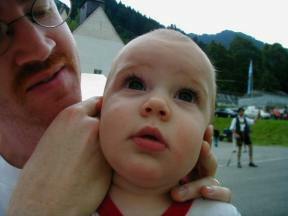 Here dad is covering up his ears to soften the noise a bit. 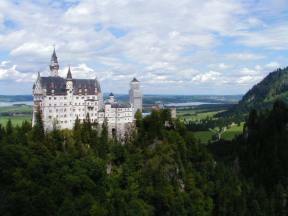 One of the things we looked forward to seeing the most in Germany was the Neuschwanstein Castle. It means literally "new swan stone." 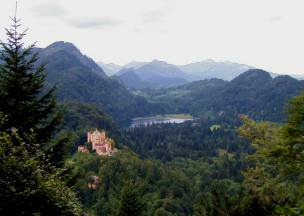 It was built in the 1800's by King Ludwig II of Bavaria (1845-1886). The king was a romantic, and wanted a castle built "in the true style of the old German knights' castles." He also loved Richard Wagner's work, and incorporated murals and other features reminiscent of Tannhauser and Lohengrin. This castle, coined the "fairy tale castle," was the model for Disney's Cinderella Castle. There was a bit of a wait to get a tour of the castle, so we hiked instead of taking a bus up the hill it sat upon. 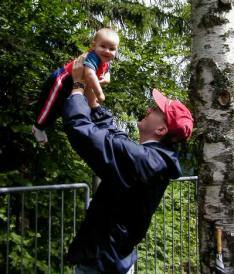 Here's a picture of Dale playing with Riley while we waited at the top for our time slot. Sorry...no pictures were allowed inside, but it was very lavish. My favorite was the beautiful murals of historic kings and scenes from Wagner operas (or at least the lore behind them) painted on the walls in several of the rooms. After the brief tour, we hiked out to the Marien Bridge, which spans the Pöllat Gorge below. This picture is taken from the bridge. 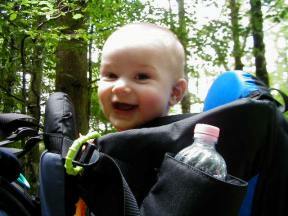 We had Riley in a brand new backpack bought anticipating a bunch of hiking. He loved it, and would grin and kick his legs with excitement each time we lowered him into it. 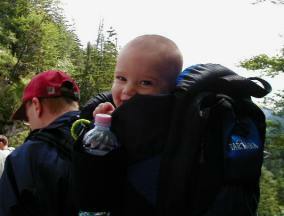 On the hike to the bridge, he loved peeking back at Mama. Here's another cute picture of Riley having a good time. He was really tickled for a while there, laughing every time I looked at him. I think he just loved being way above Mom. I guess I'd better get used to it if he has Dale's genes! On our way back from the bridge, we had a nice view of another castle, or "Schloss," in the distance. After visiting Neuschwanstein Castle, we decided to spend the rest of the afternoon shopping and dining in the ski resort village of Lermoos, just across the German border in Austria. 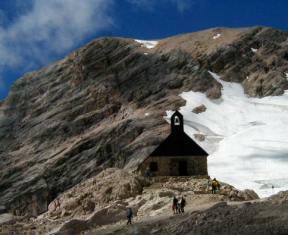 It was a beautiful glacier-carved valley surrounded by Alps, including the Zugspitze. The grassy meadows that lined the foothills were bright green, with an assortment of purple and yellow wildflowers that glowed in the golden afternoon sunlight. 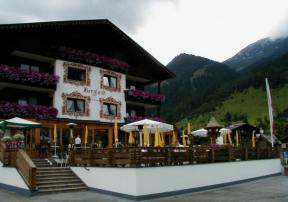 We finished shopping, and found a lovely hotel/restaurant called the Bergland to dine at. We ate outside on the deck, and had a beautiful view of the mountains surrounding us. I regret not taking a picture of the scenery we were surrounded by. 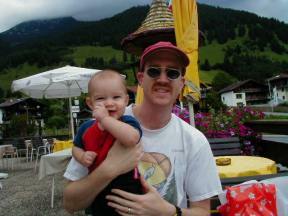 Dale enjoyed the best wienerschnitzel he had ever had, and I had genuine Hungarian goulasch. By the end of our meal, dark clouds began to filter in and shrouded the tops of the mountains. Dale and Riley posed for a picture at our table. 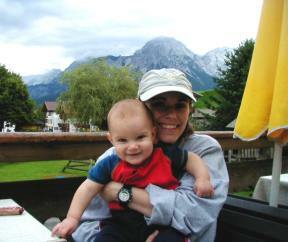 Sandi and Riley with the Alpenspitze in the background (the Zugspitze was in the clouds to the left). 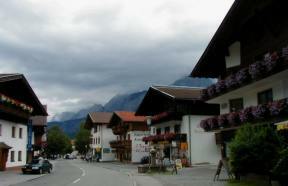 Here's a shot of some of the shops lining the main road through Lermoos. The windowboxes bulged with petunias and gardenias, and you can barely pick out the mountains that loom above the village.